The atmosphere was jubilant. Punks young and old, male and female, slowly began to fill the House of Blues as openers Dog Company and The Bellrays did their best to warm them up in preparation for punk legends The Damned. Celebrating 40 years as a band, The Damned are best known as the first U.K. act to release a punk single. Nevertheless, punk was merely a springboard as the band evolved through the years. Exploring aspects of goth and new wave along the way, The Damned remain a rock n’ roll band, no matter how you want to pigeonhole them. All that said, their set drew heavily on their earliest punk efforts and the adoring crowd had zero complaints. The Damned live at House of Blues, Dallas. Photo by J. Kevin Lynch. Having suffered a cracked rib following a spill on an earlier date in the tour, guitarist Captain Sensible sat atop a toilet for the duration of the set. Don’t worry, his presence was not subdued, rather the permanent smile on his face and his flawless guitar work displayed a man who loved playing live and refused to let the audience down. Frontman Dave Vanian strutted, twirled, and nailed every vocal line with the same intensity he did four decades earlier. Adorned in all black (including black gloves), sunglasses, and a graying beard, Vanian was at peak performance. Keyboardist Monty Oxymoron spastically jumped around, swinging his arms in the air and bobbing his head full of long curly hair as the rhythm section of drummer Pinch and bassist Stu West held down the songs in perfect time. Following the main set, the band would return for two three-song encores. The crowd, perhaps knowingly, refused to move until the house lights went up. Their patience was rewarded. “Nasty,” “Born to Kill,” “Fan Club,” and the final song of the hour and 45-minute set, “Smash It Up,” were played with the same energy as the first half-dozen songs of the set. Throughout the night it became obvious to me that Captain Sensible is a highly underrated guitarist. His leads and solos were hot, even if he was sitting down. And Vanian’s voice was a strong as it was on the first song. Indeed, Vanian epitomizes the qualities found in a great singer and frontman. 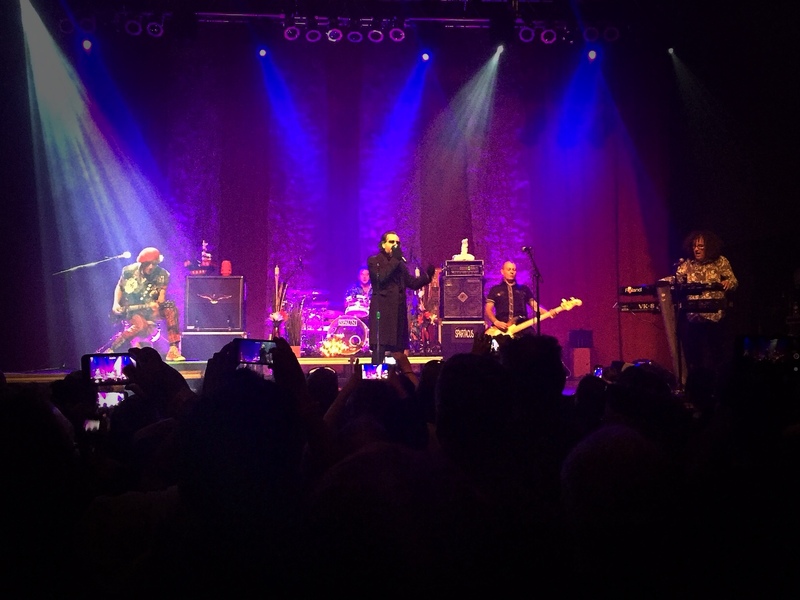 The Damned live at House of Blues, Dallas, TX. Photo by J. Kevin Lynch. Without question, this was a great show. In fact, it’s easily among the top three performances in Dallas this year. Even if you’re a casual fan of The Damned, you will leave energized and inspired by this show. There are only a few dates left for the band stateside, we recommend doing whatever you can to catch them.